One of the greatest Britons had his formative experience in India. On June 18, 2015, Britain will celebrate the 200th anniversary of the Battle of Waterloo. There, southeast of Brussels, on the gentle slopes of Mont St Jean, 170,000 soldiers fought furiously to decide the fate of Europe for the next hundred years. Napoleon’s return from Elba had threatened to again upset the balance of power on the continent, but at Waterloo he suffered his final defeat at the hands of armies led by Sir Arthur Wellesley, the Duke of Wellington. Wellington, then Colonel Arthur Wesley (the last name was later changed to Wellesley) of the 33rd regiment, arrived in Calcutta at the age of 28 in February 1797, after a journey of more than three months. His most recent biographer, Rory Muir, described Colonel Wesley as “an unusually ambitious, intelligent and well-read officer who looked far beyond the horizons of his regiment . . . and who was already comfortable assembling his thoughts into coherent arguments . . .” In all, he spent eight years in India, where for much of the time his brother was Governor-General. Wellington’s time in India, writes Muir, “were crucial years in which he developed his skills as a commander of men, a tactician, a strategic planner and a civil governor.” It was in India that the future victor of Waterloo and future prime minister of Great Britain first dealt with questions of war and peace and civil government. On March 26, 1799, troops under Wellington’s command came under attack by forces of Muslim ruler Tipu Sultan, the Tiger of Mysore. As the French-trained enemy forces approached, wrote Elizabeth Longford, Wellington’s men held their fire “with the utmost steadiness until the enemy were sixty yards away.” British infantry then decimated the columns of enemy attackers, spreading confusion, while cavalry forces scattered the remnants of the attacking force. Then, during April and May 1799, Wellington participated in the siege of Seringapatam in Mysore, and led an attack on the entrenchments of the fortress there.After Seringapatam was taken, Wellington was made civil governor and remained there until 1802. During his time in Seringapatam, Wellington was ordered to suppress a rebellion in north Mysore led by Dhoondiah Waugh. For the first time, Wellington exercised independent command in battle. During this operation, Rory Muir explains, Wellington “displayed all the characteristics of his subsequent campaigns, . . .” which included attention to logistics and “unremitting aggression.” He fought a battle at Conaghul and won a complete victory. Muir writes that Wellington exhibited a remarkable flexibility on the field of battle. A British officer commented on Wellington’s “alacrity and determination” during battle. All of the characteristics of generalship that earned Wellington great fame on the Peninsula and at Waterloo were on display in India. 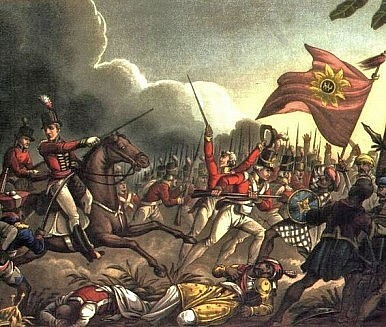 The victory at Waterloo two hundred years ago owes much to Wellington’s baptism by fire at Mysore and Assaye. The British didn't come to South Asia and immediately become the predominant power.